The first time he tricked a woman and sold her to a brothel, Mr Nam earned about $50. He had thought it would be more, and was promised that next time he would be much happier. The buyers were right. In between his on-again / off-again job as a xe om (motorbike taxi), Mr Nam was easily able to befriend young women who came into town with empty pockets in need of a job. By giving them a little money from time to time, and free rides around town, he quickly built their trust. So when he told them about a lucrative employment opportunity to the north in China, most were quick to agree. Soon he was earning up to $500 for each young woman he could hand over to Mrs Ping, his Chinese friend. But when he added it all up, he knew that the cash he received did not compensate the months of work it took to get each woman across the border. Eventually Ping rang him with a brilliant idea. The women could be taken into China and kept there in the countryside; nobody would buy them. Instead, single men in need of an heir could pay to impregnate them, and 9 months later could have a child. And then, after a few months to recover, the women’s womb could be rented out again – and again and again. Instead of each woman earning $500 just one time, they could yield much more on an ongoing basis. The stress of finding new victims would ease right off and the money would roll in. This story is fiction. I don’t know a “Mr Nam” or a “Mrs Ping”. But I know they are out there, because right now their victims are starting to be heard. In October last year, Blue Dragon rescued a young woman who had been sold into forced surrogacy just like in the story. And then in December, her information led the Chinese police to the location where she had been held; altogether 9 women were rescued, and there is evidence that there had been even more women held there in the past. 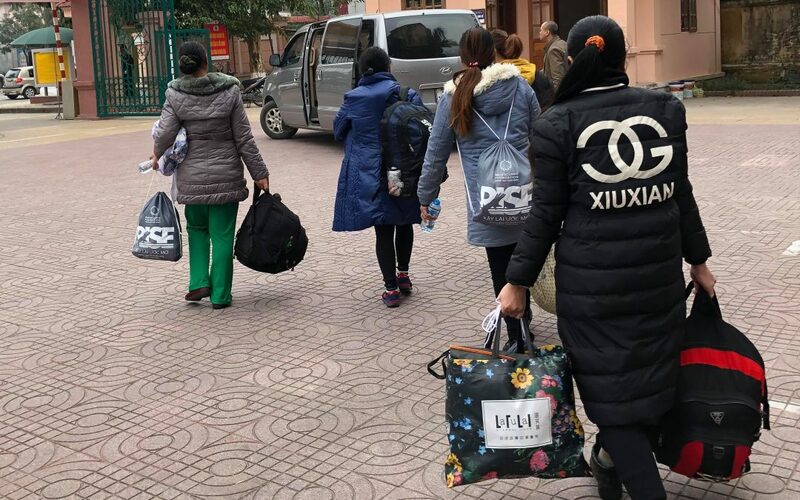 This week, Chinese police handed 4 women back to Vietnam, all of whom had been found in a raid on another “baby farm”. As of this moment, their statements are still being taken in their home province of Nghe An, in north-central Vietnam, and soon they will be home with their families. People often ask me if trafficking is getting better or worse. Usually that question refers to the statistics: are there more people being trafficked, or is it in decline? The truth is that data is so unreliable that it’s virtually useless. What we are seeing, though, is a constant evolution and adaptation of human trafficking: and yes, it’s getting worse. I cannot imagine the horror of a woman being deceived into visiting another country then held against her will and sold; then raped until she is pregnant; only to have her baby taken away and sold, so that she can be raped again. And I struggle to believe that this nightmare scenario is being played out right now, in 2019. It should be impossible, but it’s not. There are many urgent challenges facing our world, and human trafficking is up there towards the top of that list. We have to stop this. It can’t be allowed to go on.